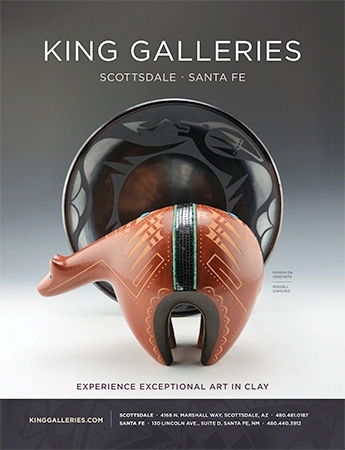 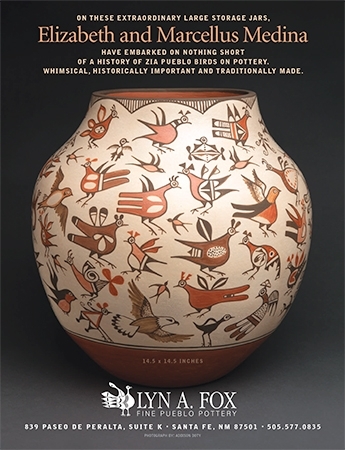 New works in clay by Anita Fields will be on view at King Galleries in Santa Fe. 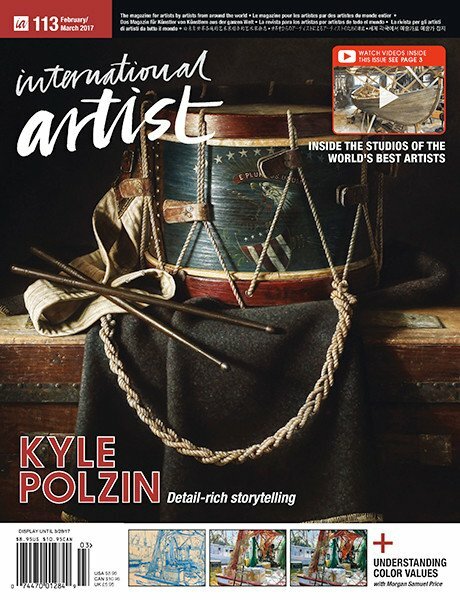 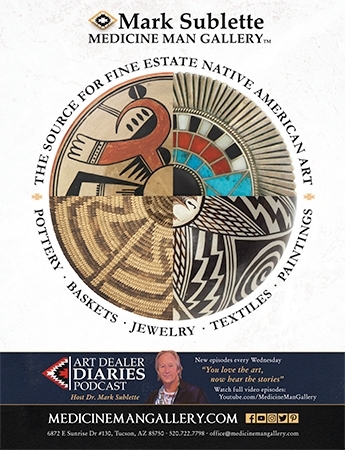 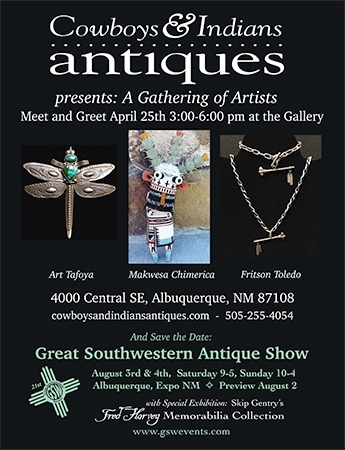 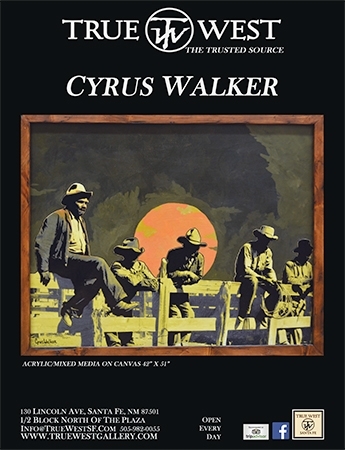 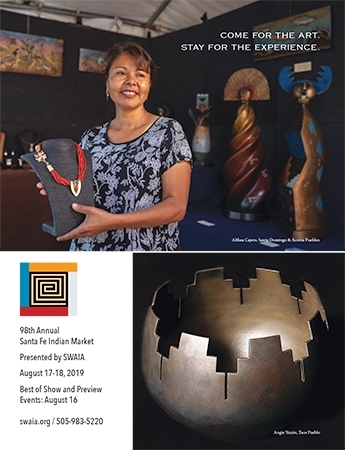 The evening event at Cowboys and Indians Antiques showcases handmade arts from three of the gallery’s 2019 featured artists. 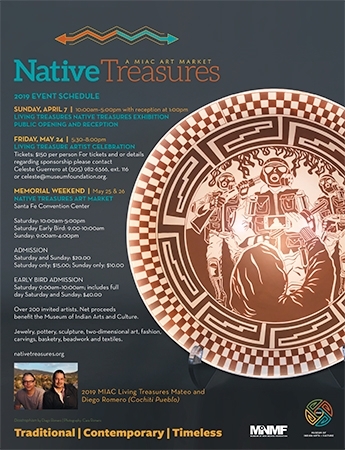 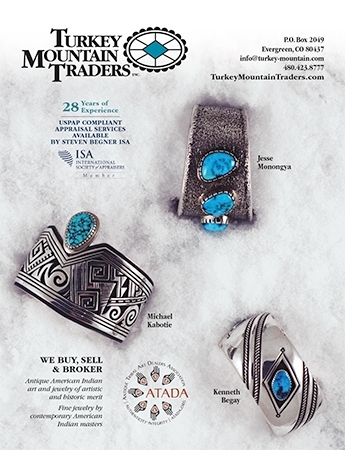 Native Treasures Art Market in Santa Fe celebrates a milestone of 15 years running. 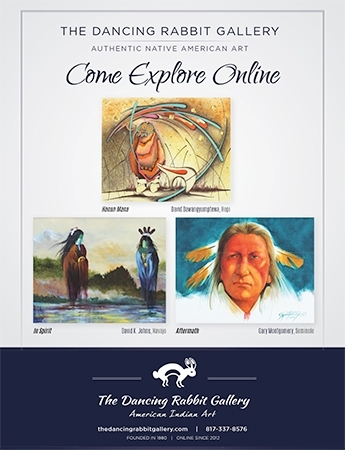 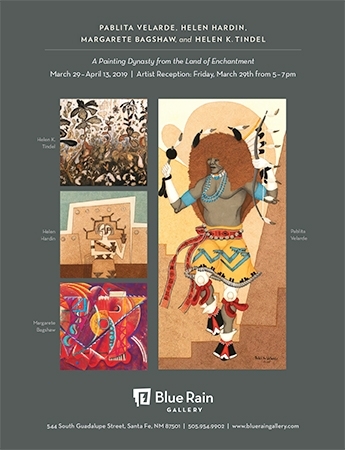 The Cherokee Heritage Center’s annual art show pays tribute to the past while looking towards the future. 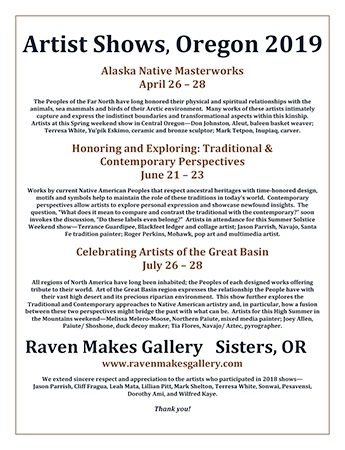 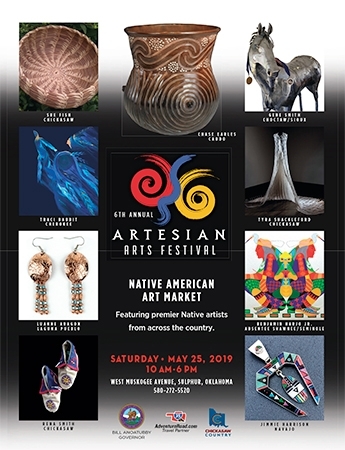 The second Abbe Museum Indian Market welcomes 75 artists and performers representing more than 40 tribes. 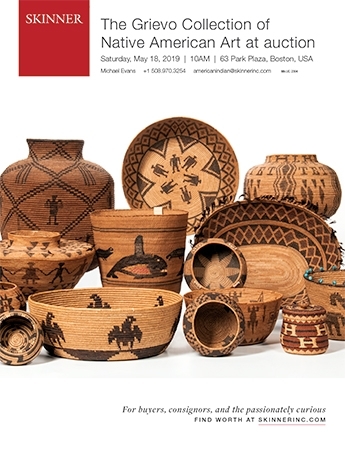 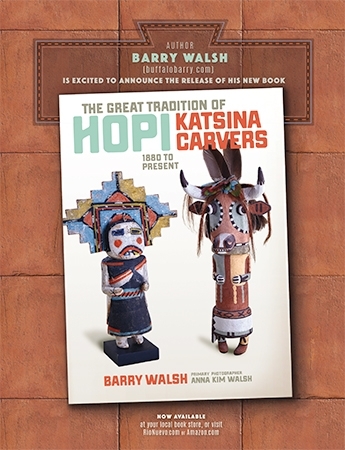 A variety of historic and contemporary Native American materials was available at Brian Lebel’s Old West Show in Arizona. 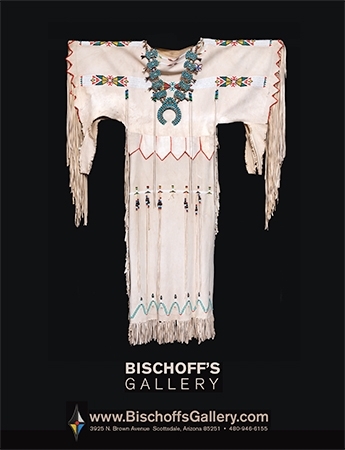 A new exhibition at the Eiteljorg Museum explores the power of beauty in historic and contemporary Native American art. 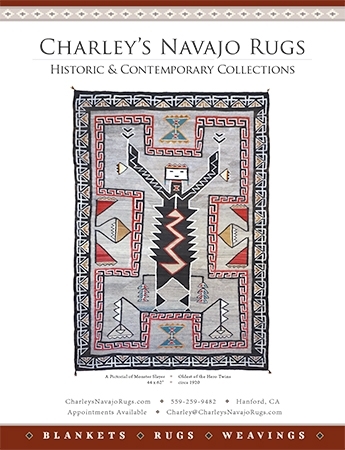 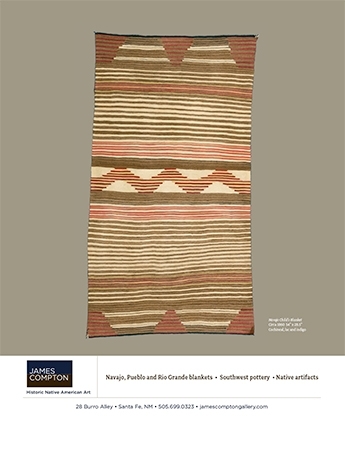 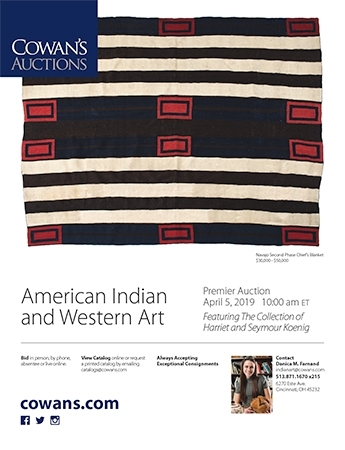 Cowan’s Auctions presents prehistoric through contemporary material during its April 5 sale of American Indian and Western art. 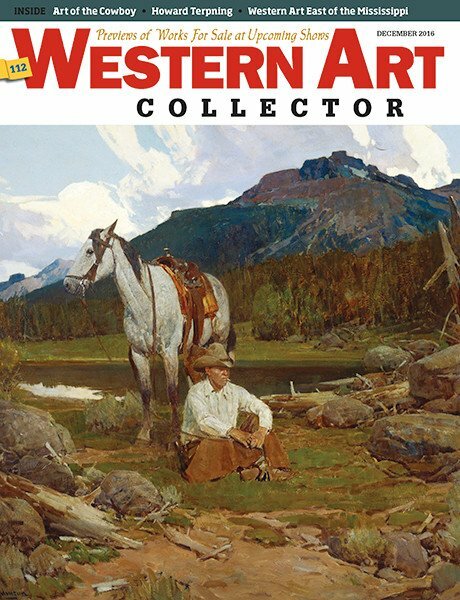 Leslie Hindman Auctioneers offers strong works in many mediums at its annual Arts of the American West sale in Denver. 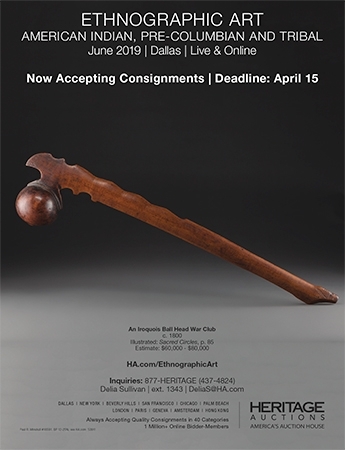 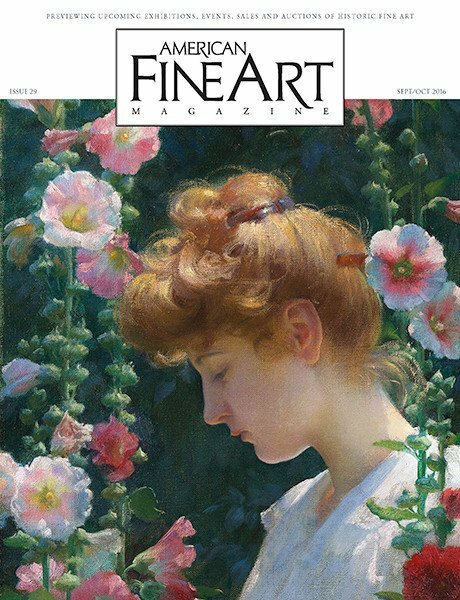 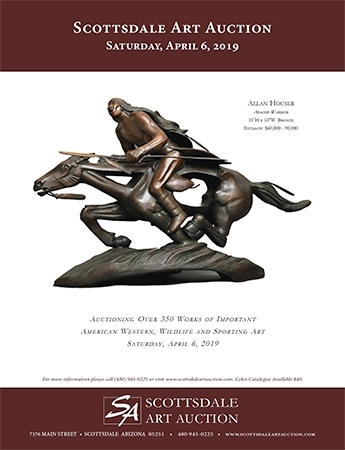 Works in stone, bronze, paint and photography are available at the Scottsdale Art Auction on April 6 in Arizona. 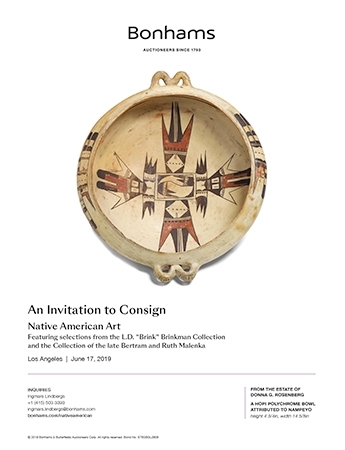 Bonhams’ single-owner auction of Native American baskets achieves nearly $1 million. 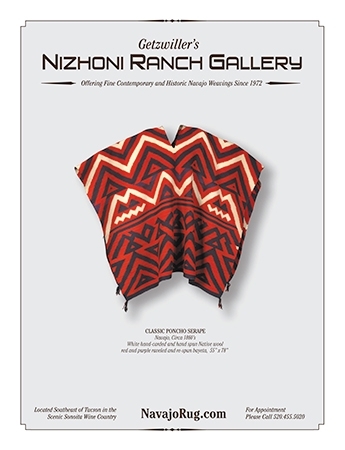 A look at the Navajo poncho serape from its early beginnings through today. 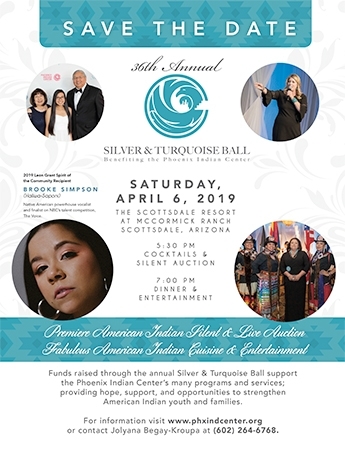 Apsáalooke fashion designer Bethany Yellowtail has a deep-rooted connection with her heritage. 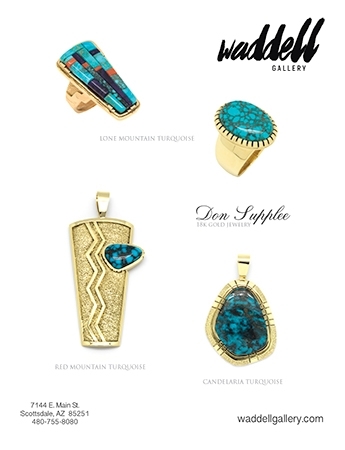 Exploring 24 of the top Native designers working in fashion today. 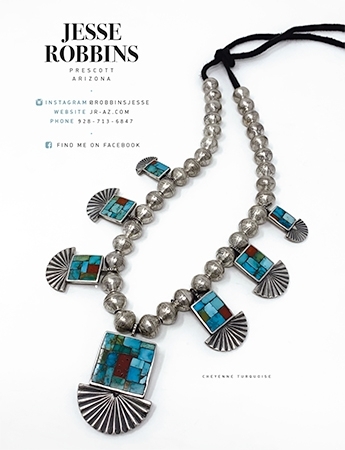 From transitional pieces to spring staples, kick off the season with these fresh picks. 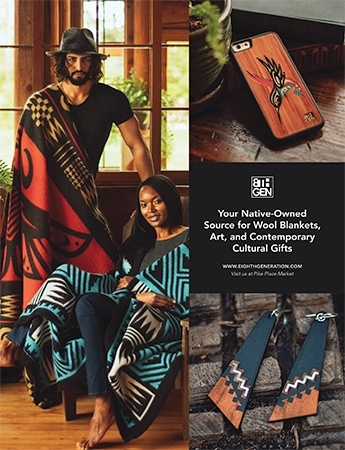 Up-and-coming Indigenous model Phillip Bread talks style, SWAIA and his Comanche roots. 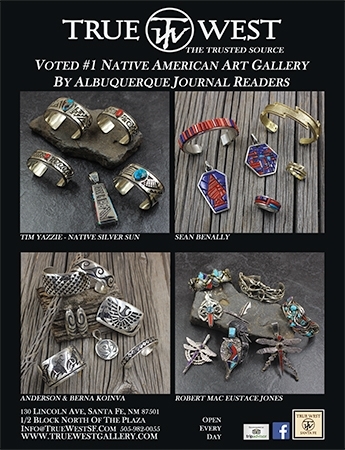 A fashion spread with clothing by leading Native designers, styled by Amber-Dawn Bear Robe. 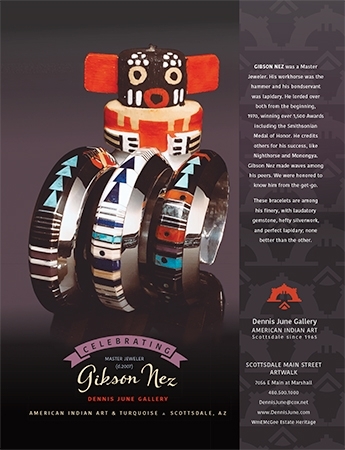 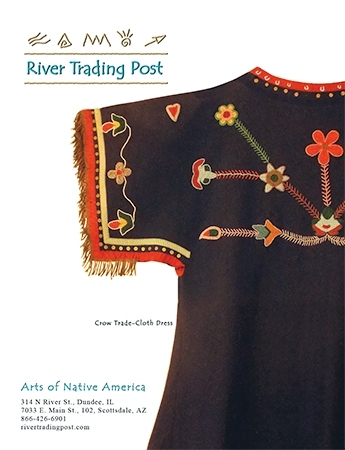 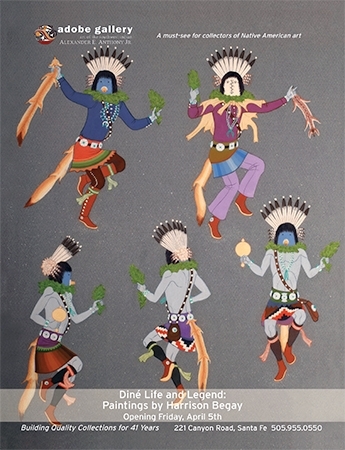 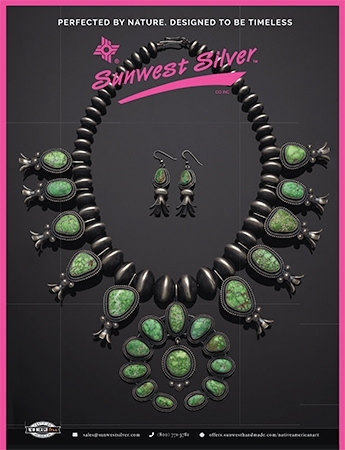 Jamie Okuma’s designs are highlighted. 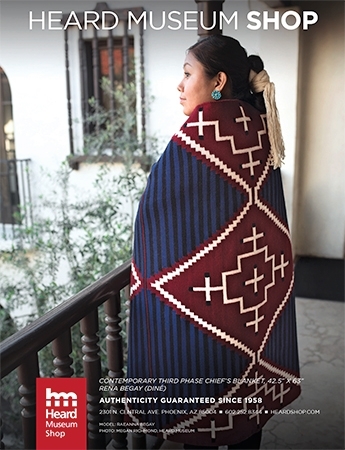 In celebration of our first-ever Native fashion issue, we invited our readers to post their fiercest Native fashion moment on Instagram. 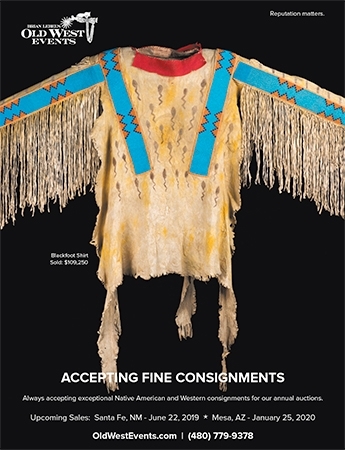 A buyer’s guide for clothing items and accessories with advice from experts. 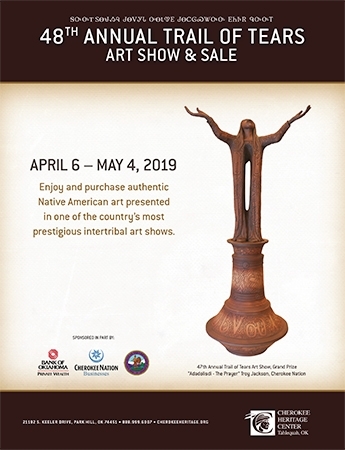 Copyright ©2019 Native American Art.